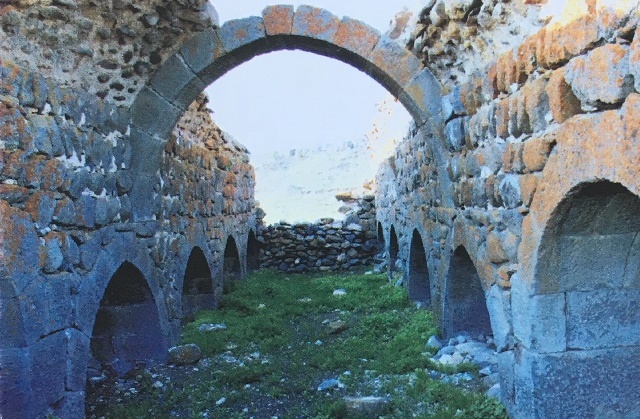 Located in the rugged backlands of the Sivas region, this han demonstrates the extensive building program led by the local dynasty, the Mengucukids of Divriği. 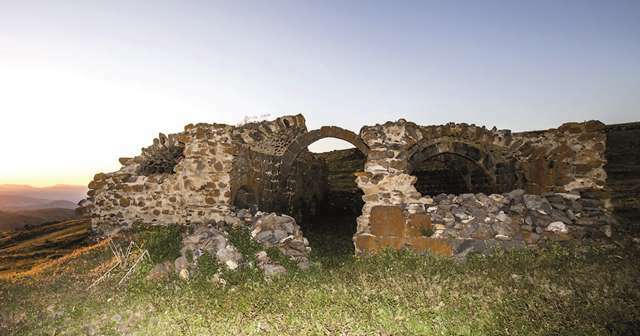 The Dipli Dumlica Han is located in the district of Divriği, between the villages of Günbahçe (Hazertek) and Dumluca, about 12 km west of Divriği. The Dumluca Han is located on the top of Dumluca Mountain in rugged terrain. 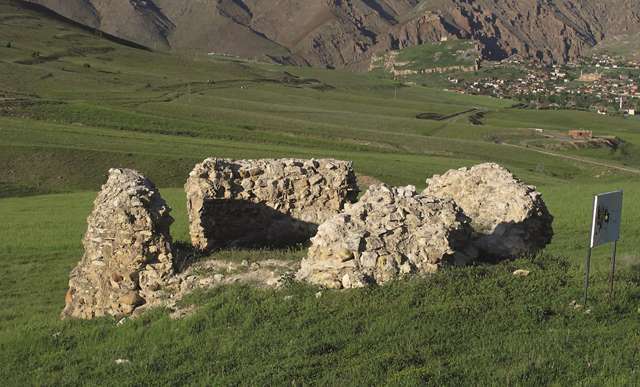 Divriği was a very developed city during the reign of Mengucukids. The roads connecting the city with other cities and the hans built on these roads were some of these important improvements of this city. The road going towards the west from Divriği and arriving at Kangal and Ulaş passes in front of the han. This earth road starts in the center of Divriği and climbs the mountain along an inclined path. This ancient road bifurcates close to the han, with one of the branches leading to the village of Dumluca, and the other leading to the village of Pengurt (Ekinbaşi). It is believed that these roads were alternative roads used in the snowy winter months. The han is the last station before Divriği on the road coming from the south. There must have been other hans in this region but they have not survived. There are many bridges along the road which follows the valleys and follow the road continuing on towards Arapgir in the southeast direction. The ruins of a building have been found in front of the han, but the structure has not been identified or dated. It is also known as the Kara Han ("Black" Han) after the dark red and brown wall stones used in its construction. There are no mentions of this han in any journals of travelers, which is not surprising due to the fact that this han is located on very rugged terrain and thus would have been by-passed if possible for the sake and safety of the animals. It is assumed that the han is named after the mountain on which it was built. As there is no inscription, the building date and the builder are not known. It is believed to date from the second half of the XIIIth century, during the reign of Mengucukid ruler Ahmet Shah, but this is not certain. The han is among the group of hans consisting of a covered shelter section only. The foundation remains on the southern side indicate that the han was probably much larger than the current remains. The covered section measures 12.90 x 5.70m. There are no remaining elements of the main door, but it can be determined that it was located on the south side. The covered section is divided into three naves by two support lines in the north-south direction. The naves are covered with pointed barrel vaults lying vertically to the wall opposite the entrance. The middle nave is both higher and wider than the side naves. There are five arches with four piers in each of the support lines. The han was built using pitch-faced stone filled with rubble and lime mortar. There are no decorative elements in the building. The han is in a ruined state today, with only one section of the lower walls at the side of the entrance and a part of the roof are intact. Eravşar, Osman. Yollarin Taniklari (Witnesses of the Way), 2017, pp. 123-126. Erdmann, Kurt. Das Anatolische Karavansaray des 13. Jahrhunderts, 1961. Vol. 1, p. 199, no. 84. Tuncer, Orhan Cesmi. Türk Etnoğrafya Dergisi XIX, Ankara, 1991. Ünal R. H. "Osmanli Öncesi Devrinden Yayinlamamiş Birkaç Han Üzerine Inceleme," in Atatürk Universitesi Edebiyat Fakültesi Araştirma Dergisi, 9, 1978, p. 456.